The death of Pradnya Paramita in Jakarta last December kicked off a debate about work hours in Asia. The 27-year-old copywriter collapsed and died after allegedly working for 30 consecutive hours. In a report last August, job-listing website eFinancialCareers found more than two-thirds of 1,738 of Singapore’s finance and banking professionals surveyed worked weekends, and about 43 percent remained contactable for work day and night. In the 2014 Human Capital Survey released by accounting body CPA Australia, staff members in Hong Kong said they endured long work days and this was a key reason for changing jobs. In reaching out to 350 accounting professionals at multinational corporations, accounting firms, listed and private companies and nonprofit organizations for the survey, CPA Australia found 45 percent of respondents hoped to change jobs in the next six months, and a third said they were looking for a better work-life balance. Salaries and career development came second and third. This may have a direct bearing on Hong Kong’s economic prospects, analysts said. “Hong Kong’s competitiveness and productiveness are two different things,” said Peter Lee, managing director at Veco Invest (Asia) and former divisional president at CPA Australia. The issue extends to most countries in the region, to varying degrees. Workers in the largest Asian cities spend more time at work than just about anyone else globally. However, this may actually be costing companies money and pushing workers away from some of the world’s fastest-growing economies. According to the International Labor Organization, most countries in Asia have a 48-hour working week, but almost a third of the countries in the region do not have a regulated maximum of hours of work. Another third put the weekly limit at 60. Japan introduced standard working hours of eight hours per day and 40 hours per week, as early as 1994. South Korea also introduced a 40-hour workweek in 2003, but that has rarely been followed. Also, the law did not count weekends, which meant employees could put in more hours during those two days and on holidays. Last September, South Korea cut the maximum number of hours that can be worked per week to 52, down from 68. 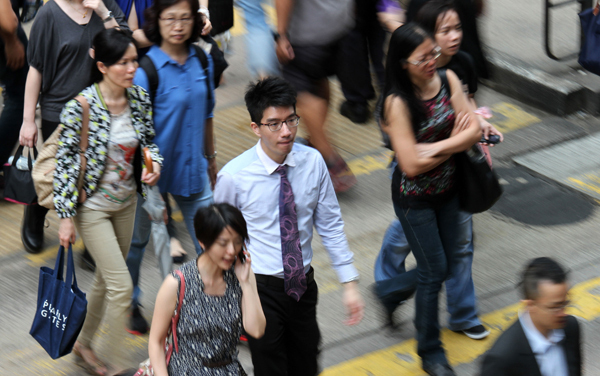 In Singapore, the working hours should not exceed eight per day, or 44 per week. That’s much longer than in countries like France, which has a 35-hour workweek, and a labor law introduced this year discourages workers in the digital and communications industries from accessing work-related emails or notifications after office hours, and also discourages employers from pressuring them to do so. Germany has a similar law and Sweden is considering a 30-hour workweek. Average workweeks in most developed economies have generally been dropping. Across the Organization for Economic Cooperation and Development countries (which includes Japan, South Korea and Australia), the average worker put in 1,765 hours of work in 2012, compared to 1,844 hours in 2000. Still, the average employee in Asia works 2,154 hours per year, 13 percent higher than the global average of 1,915 hours, according to the UBS Prices and Earnings report from 2012 that the investment bank publishes every three years. But despite the long hours, Asian workers are not necessarily more productive. In terms of GDP per hours of work, the most productive workers in the world are in the United States, the Netherlands, France, Germany, Sweden and Australia, according to The Conference Board, a global business membership and research association. Among the five cities in the world with the longest working hours, three are in Asia. Hong Kong ranked third among the 72 cities surveyed, with the average worker spending 2,296 hours per year at her or his job. In Bangkok, workers spend 2,312 hours at work every year and in Seoul 2,308. In Shanghai, the average work year is 1,967 hours and in Tokyo it is 2,012 hours. In New York, the average employee works 2,062 hours in any given year and 2,375 in Mexico City, which gives it the honor of having the longest work hours in the world. In Paris, the average worker spends just 1,558 hours at work. On the one hand, the long work hours have been a key driver of economic growth. On the other, employees get burned out quickly and are more likely to change jobs faster. This creates a problem for companies, which have difficulty retaining staff. Higher turnover translates into higher costs. In general, companies are not ready to deal with the challenges of retaining staff, according to another survey by Deloitte, an accounting and consulting firm. In its Global Human Capital Trends 2014, the firm found that leadership, retention and engagement are key priorities for companies around the world, but few are prepared to ensure workers benefit from them. And in the Asia-Pacific region, where the hours are the longest and retention the biggest problem, dealing with the issue was a priority for 12 percent fewer respondents. Across the region, companies said they needed to improve the capabilities of their workforce. “Different regions may have different modules for setting out the standard working hours,” says Loretta Shuen, chairman of the taxation committee of CPA Australia. Although Hong Kong has been considering standard working hours since 2010 and the Labor Department completed a policy study in mid-2012, nothing has happened since. CPA Australia’s survey showed half of the respondents work 41 to 50 hours per week and 40 percent work more than 51 hours per week. One in five people work more than 61 hours per week. What’s more, nearly half of employees work overtime without compensation. The department’s study showed 23.4 percent of all employees did overtime in 2011. Of these, 51.8 percent were compensated through extra pay or time off in lieu, but 48.2 percent received no compensation at all.